I'm not certain of the exact species of this cactus, but Jack says that it's not cold hardy. A little Internet research shows that there are two different spineless prickly pears available. 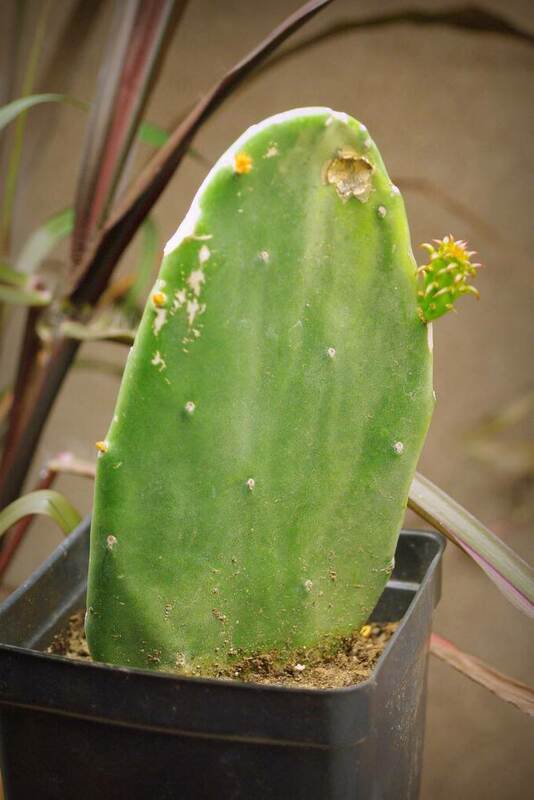 One is Opuntia cacanapa 'Ellisiana' which is cold-hardy to at least zone 7. If you remember, I received some of these last year in a plant trade -- this will be the first winter that I leave one of them outdoors. I expect it to do fine unless we have a particularly cold winter. 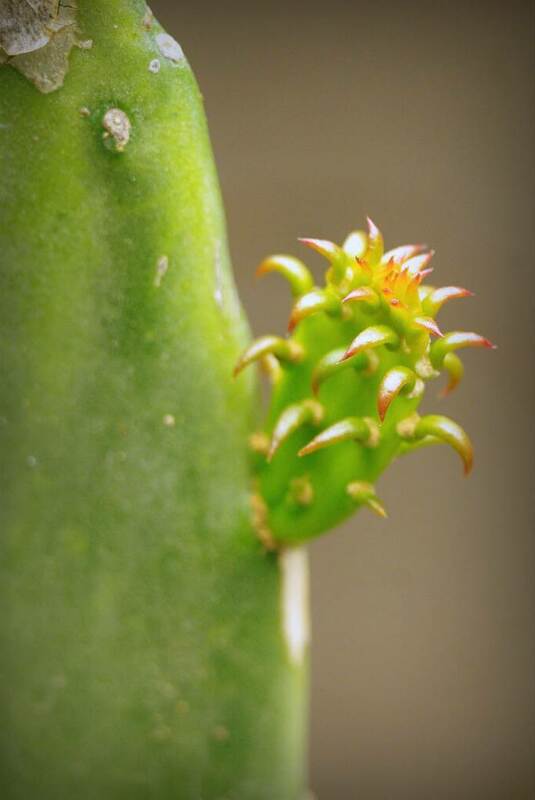 If this new plant is not cold-hardy, then the ID is simple: it's probably Opuntia ficus-indica, either the "inermis" form, or 'Burbank spineless'. I'm not positive on the ID, but that's what I'll go with for now. One thing I am sure about, this guy is awake and raring to grow! Since almost everything Jack and Nolan grow is edible, I shouldn't be surprised that they call these "nopales" cactus, as that's the name for the prickly pear pads when used as a vegetable. I'm not sure what the soil mix is that Jack used, but this is obviously a well-rooted and happy plant under my lights indoors. I wonder if it will continue growing and producing new pads all winter long? 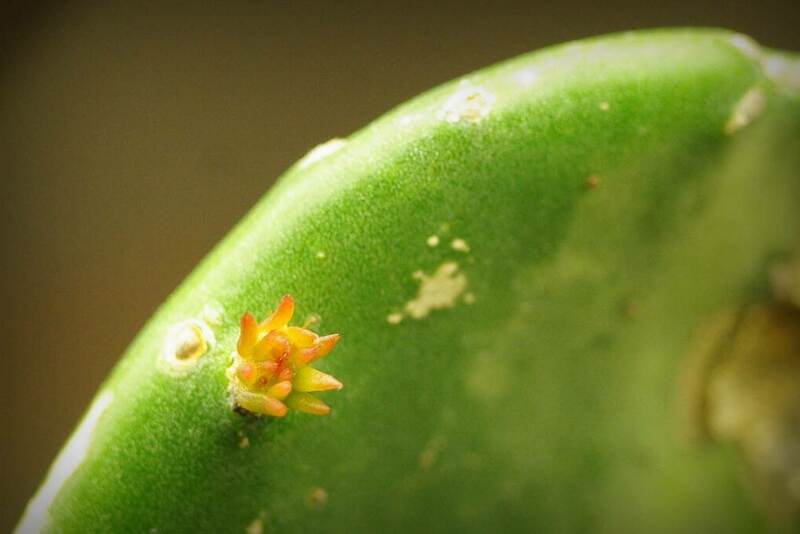 If so, I may need to start researching nopales recipes soon. 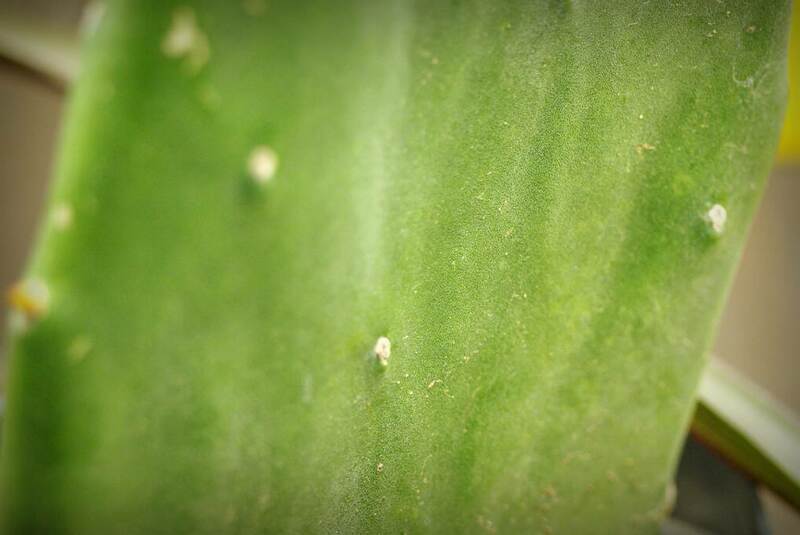 I enjoy reading about cactus as it is so different from what we grow. I'm zone 5 in southern Canada and have one native cactus cultivar that grows sparingly on our acreage. This year they bloomed in the spring, the first time I have seen blooms in 15 years. Great photos, the new paddles are so colorful (and innocent looking) when they first emerge don't you think? BTW when I log on to my GMail account Google has been hitting me with various adds for nopales products (recipes, lotions, juices) for months now. I haven't clicked on any because that would seem to justify their madness. 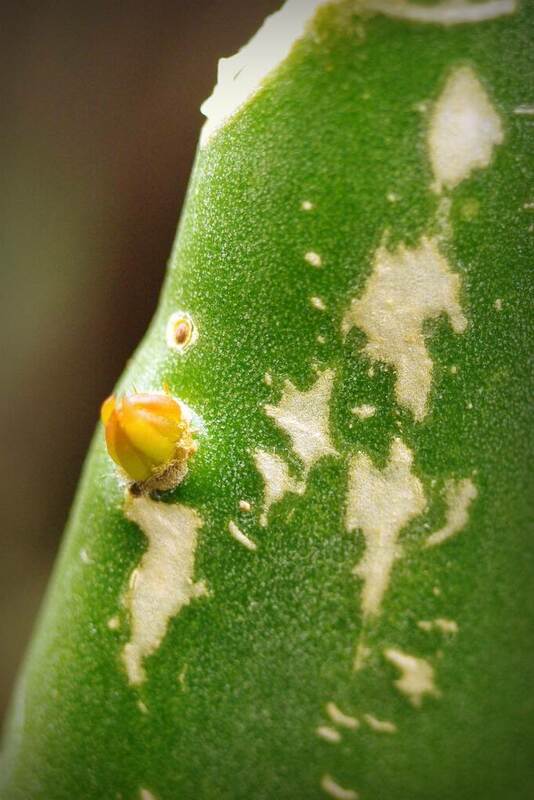 Here in California, nopales are typically from Opuntia ficus-indica but they could be from other species too. 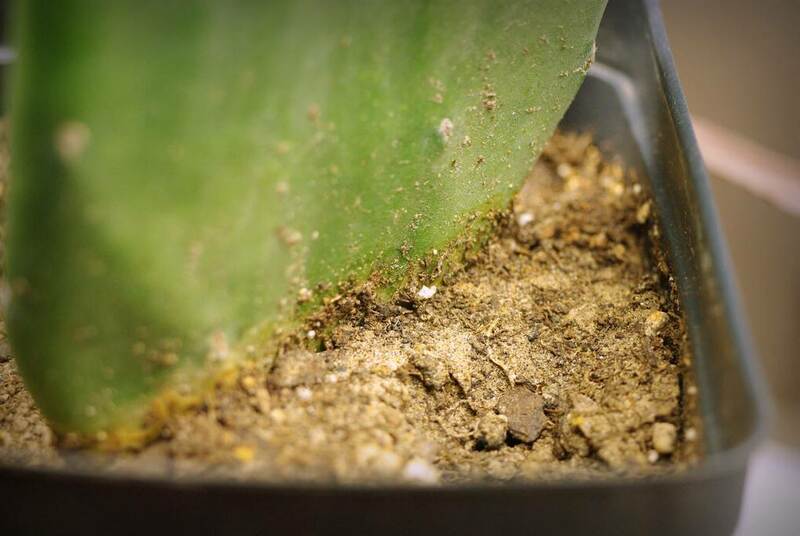 It's very hard to tell these smooth opuntias apart when they're small. 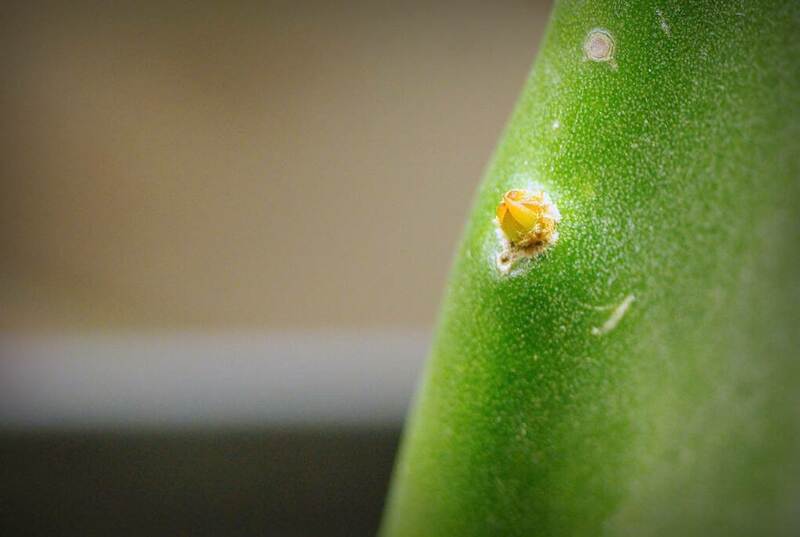 Judging from the color and shape of the cladode, yours could definitely be O. ficus-indica. Nopales are an acquired taste. I grilled some this summer but nobody much liked them. They're probably better disguised in a stew, or in an egg dish like huevos con nopales. A Peruvian restaurant here serves them and they are quite good. I think it's all in the preparation.